Orthodontic problems don’t improve with age — they simply become harder to treat. It’s easier to treat many orthodontic problems during adolescence because the body is still growing rapidly at this time. There are several good reasons why adolescence is the optimal time for orthodontic treatment, though occasionally early orthodontic treatment is called for in some cases. 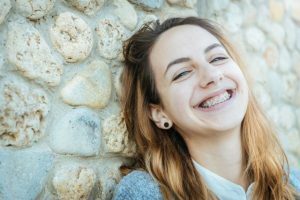 For many teens, braces are a rite of passage: They’re one more example of the changes adolescents go through at this time — along with growth in stature, edgier tastes in clothes and music, and an increasing degree of self-awareness. But is there any particular reason why orthodontic appliances and teenagers seem to go together? In a word: Yes. One has to do with the development of the teeth: While there is no set timetable for every kid, generally by the age of 11-13 the deciduous (baby) teeth have all been lost and the permanent ones have largely come in. This is the time when we can go to work correcting the problems that cause a bad bite (malocclusion), improper tooth spacing or poor alignment. Secondly, whether we use standard braces, or appliances like palatal expanders, we can create an improved appearance and function in a short period of time. In later years, when the bones of the face and jaw are fully developed, many conditions become more difficult (and costly) to treat. Especially for teens, improved appearance can have a major impact on self-image and lead to increased confidence. Many teens discover a social element to getting orthodontic treatment. If you need braces, you will discover you’re not alone! Chances are good that you’ll see some of your classmates in our office and even solidify and make new friendships as you go through the process together. Our teenaged patients find that when their treatment is done, they will have a smile that they can be proud of, and the benefits will last a lifetime! Today we also offer Invisalign for Teens (Invisalign Teen). These are clear aligners that are virtually invisable. Metal Braces: You’ll find that braces today are much better than the braces worn years ago. They are smaller and lighter than ever and even offer some customized options, like colored elastic ties on the brackets. We use low profile brackets, made by American Orthodontics, and these brackets are made in the USA. Clear Braces: These braces feature brackets made of ceramic or composite materials that are made to blend in with your teeth making them harder to notice. They cost a bit more, but the cosmetic benefits are unmistakeable. Clear Aligners: (Invisalign) A series of removable, clear plastic trays that straighten your teeth as they are worn 22 hours per day. Parents will appreciate the compliance indicators which help you keep track of how often you’re wearing them and help you stay on track with your treatment. They’re great for teens and they’re practically invisible! There’s no one answer that fits everyone: It all depends on what we need to do in your individual situation. Generally, however, the active stage of orthodontic treatment lasts 12-24 months. Afterwards, you will wear a retainer and when your orthodontic treatment is complete, the new smile we’ve worked together to create will be yours for a lifetime.